Lucy Mackey is a partner at Innis Law Group with more than a decade of experience in the practice of intellectual property law. She focuses on litigation involving trademark, unfair competition, and licensing issues as well as global trademark portfolio management and enforcement and counseling on various advertising and marketing issues, including sweepstakes and promotions, packaging and labeling, claim substantiation, and privacy issues. Lucy has directed numerous opposition and cancellation proceedings before the U.S. Trademark Trial and Appeal Board and leads similar proceedings around the world. She has extensive experience in domain name portfolio protection through litigation under the Uniform Domain-Name Dispute-Resolution Policy. She also advises clients on Federal Trade Commission compliance and represents them before the National Advertising Division. Lucy has been with ILG since the beginning. She previously practiced as an associate attorney at an Am Law 100 firm where she represented clients in intellectual property and commercial litigation and dispute resolution. 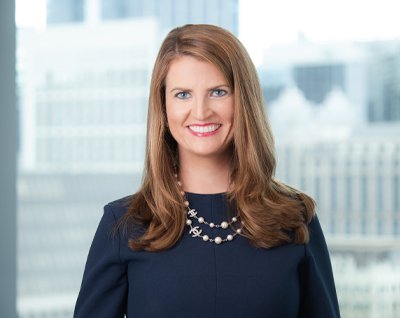 Lucy was recently recognized by the Leading Lawyers Network as a 2018 “Top Lawyer in Illinois” in Advertising & Media Law and Copyright & Trademark Law. Lucy enjoys speaking at events in Chicago and throughout the country. She recently served as a panelist at the 2018 John Marshall Law School fashion law symposium and led the table topic at the INTA’s annual meeting entitled: The Intersection Between Fashion and Cosmetic Brands and Social Media.